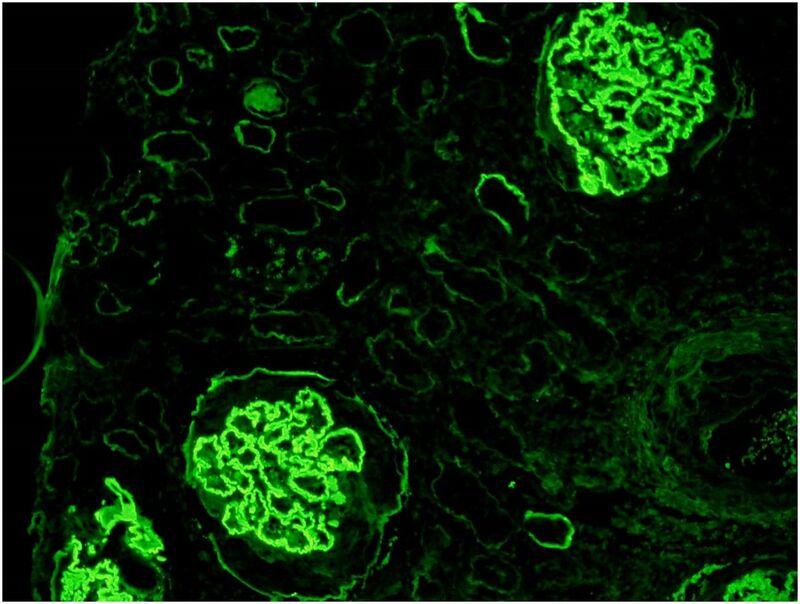 Anti–glomerular basement membrane (anti-GBM) disease is a rare small vessel vasculitis that affects the capillary beds of the kidneys and lungs. It is an archetypic autoimmune disease, caused by the development of directly pathogenic autoantibodies targeting a well characterized autoantigen expressed in the basement membranes of these organs, although the inciting events that induce the autoimmune response are not fully understood. The recent confirmation of spatial and temporal clustering of cases suggests that environmental factors, including infection, may trigger disease in genetically susceptible individuals. The majority of patients develop widespread glomerular crescent formation, presenting with features of rapidly progressive GN, and 40%–60% will have concurrent alveolar hemorrhage. Treatment aims to rapidly remove pathogenic autoantibody, typically with the use of plasma exchange, along with steroids and cytotoxic therapy to prevent ongoing autoantibody production and tissue inflammation. Retrospective cohort studies suggest that when this combination of treatment is started early, the majority of patients will have good renal outcome, although presentation with oligoanuria, a high proportion of glomerular crescents, or kidney failure requiring dialysis augur badly for renal prognosis. Relapse and recurrent disease after kidney transplantation are both uncommon, although de novo anti-GBM disease after transplantation for Alport syndrome is a recognized phenomenon. Copresentation with other kidney diseases such as ANCA-associated vasculitis and membranous nephropathy seems to occur at a higher frequency than would be expected by chance alone, and in addition atypical presentations of anti-GBM disease are increasingly reported. These observations highlight the need for future work to further delineate the immunopathogenic mechanisms of anti-GBM disease, and how to better refine and improve treatments, particularly for patients presenting with adverse prognostic factors. Anti–glomerular basement membrane (anti-GBM) disease is a rare small vessel vasculitis that affects glomerular capillaries (where it may result in glomerular necrosis and crescent formation), pulmonary capillaries (where it may cause alveolar hemorrhage), or both. It is characterized by the presence of circulating and deposited antibodies directed against basement membrane antigens, and as such is classified an immune-complex small vessel vasculitis in the Revised International Chapel Hill Consensus Conference Nomenclature of Vasculitides (1). The Consensus acknowledges the relative misnomer of anti-GBM disease, given the frequent involvement of alveolar basement membranes, although recognizes the widely accepted use of anti-GBM disease to describe this condition with or without lung involvement. The eponymous term “Goodpasture disease” is also used to describe this condition, first being used by Australians Stanton and Tange in 1958 (2), in their report describing nine cases of GN associated with lung hemorrhage. They credited Ernest Goodpasture, an American pathologist, with the first description of the syndrome in his 1919 paper describing a fatal case of GN and lung hemorrhage that was, at the time, attributed to an atypic influenza infection (3). We do not know, however, if any of these patients had anti-GBM disease as we recognize it today, because it was not until the development of immunofluorescence techniques in the 1960s that it became possible to detect anti-GBM antibodies in kidney tissue (4), and to demonstrate their pathogenic potential upon elution and transfer to nonhuman primates (5). The detection of circulating anti-GBM antibodies in patients quickly followed (6), and the first comprehensive clinical description of “anti-GBM antibody–induced GN” was by Wilson and Dixon (7). It is of historical interest to note that Goodpasture’s original description of lung and kidney disease in association with intestinal and splenic inflammation, after a subacute clinical presentation, was perhaps more in keeping with a diagnosis of ANCA-associated vasculitis (AAV) than anti-GBM disease, and that Goodpasture himself is said to have rejected the eponymous use of his name. The term “Goodpasture disease” has persisted, however, being generally reserved for patients with demonstrable anti-GBM antibodies, whereas “Goodpasture syndrome” may be used to describe copresentation with GN and pulmonary hemorrhage of any cause. We will use the term “anti-GBM GN” when referring specifically to the kidney involvement seen in this condition, and “anti-GBM disease” when referring to the broader spectrum of kidney and lung disease. Given its rarity, definitive observations regarding the incidence of anti-GBM disease are lacking. It is often said to have an incidence of <1 per million population/yr in European populations, largely on the basis of single-center biopsy- or serology-based series, although accurately defining populations at risk in such studies is difficult. A recent study from Ireland is notable for being the first to define a nationwide disease incidence, by identifying all cases over a decade via reference immunology laboratories and a nationwide pathology database (8). It reported a disease rate of 1.64 per million population/yr, higher than previous estimates. The disease is well recognized in other white and in Asian populations (9–12), although is thought to be rarer in African populations (13). Anti-GBM GN accounts for 10%–15% of all cases of crescentic GN in large biopsy series (14), although it appears to be a rare cause of ESRD (15). A common observation from larger series of anti-GBM disease is that of a bimodal age distribution, with peak incidences in the third decade, where a slight male preponderance and presentation with both kidney and lung disease is observed, and in the sixth to seventh decades, where presentation with isolated kidney disease is more common (16–18). Some series have reported disease “outbreaks” and seasonal variation in incidence (16,17), and the Irish study identified spatial and temporal clustering of disease, suggesting that environmental factors may be important triggers for disease onset, although they are yet to be accurately defined (8,19). Infectious associations, particularly with influenza A, have been the subject of anecdotal reports (20,21), and may account for the aforementioned seasonal or geographic “clustering” of anti-GBM disease cases, and a recent study described a high prevalence of prodromal upper and lower respiratory tract infection in a cohort of 140 Chinese patients (22). The causative nature of these associations, however, is not proven and remains speculative. A more conclusive environmental association is that with cigarette smoking and the development of lung hemorrhage in anti-GBM disease (23). Similarly, inhalation of hydrocarbons has also been implicated in disease onset (24). It is suggested that localized inflammation induced by inhaled toxins may increase capillary permeability, or potentially disrupt the quaternary structure of the alveolar basement membrane, exposing usually sequestered antigens and allowing access to pathogenic autoantibodies. A more recently identified trigger for anti-GBM disease is treatment with the anti-CD52 mAb, alemtuzumab, a lymphocyte-depleting agent that is increasingly used in the treatment of relapsing multiple sclerosis (25). It is thought that loss of regulatory T cell subsets, or abnormal immune cell repopulation after depletion, may account for the increased incidence of many autoimmune diseases, including anti-GBM disease, after exposure to this agent. It is likely that these environmental triggers act in genetically susceptible individuals to induce disease onset. Anti-GBM disease has a strong HLA-gene association, with approximately 80% of patients inheriting an HLA-DR2 haplotype. A hierarchy of associations with particular DRB1 alleles has been identified, some positively associated with disease (DRB1*1501, DRB1*0401) and some conferring a dominant-negative protective effect (DRB1*07), which might be attributed to the higher affinity of the latter alleles for binding peptides from the target autoantigen (26). The DRB1*1501 association has been replicated in Asian populations (27,28). It should be noted, however, that these susceptibility alleles are common in most populations and that they are also associated with other autoimmune diseases (including multiple sclerosis, perhaps contributing to the association with alemtuzumab treatment), highlighting that other factors are necessary to incite anti-GBM disease, and thus HLA-gene testing is not routinely used in the clinical work-up of these patients. Polymorphisms and copy number variation in non-HLA genes have also been implicated in disease susceptibility, such as the genes encoding Fcγ-receptors (29,30), consistent with the role of pathogenic autoantibodies in disease onset. On the basis of a small study, polymorphisms in COL4A3, the gene encoding the Goodpasture autoantigen, are not thought to be involved in disease predisposition (31). To the best of our knowledge, there has not been an undirected genetic study in anti-GBM disease. In its native form, the GBM consists of a network of type IV collagen molecules, each made up of triple-helical protomers of α3, α4, and α5 chains (Figure 1). The principal target of the autoimmune response in anti-GBM disease has been identified as the noncollagenous (NC1) domain of the α3 chain of type IV collagen (α3[IV]NC1; the “Goodpasture autoantigen”) (32,33). The clinical pattern of reno-pulmonary disease reflects the restricted expression of this antigen to the basement membranes of glomerular and alveolar capillaries (and to a lesser extent, the retina, choroid plexus, and cochlea, where it is generally not associated with clinical disease ). Two principle autoantibody (B cell) epitopes within the autoantigen have been identified, designated EA and EB (35), which in native GBM are usually sequestered within the quaternary structure of the noncollagenous domains of the triple helix of α3, 4, and 5 chains. Structure of the glomerular basement membrane. In its native form, the collagen IV network in the glomerular basement membrane consists of triple-helical protomers of α3, α4, and α5 chains (shown individually in [A]). The carboxy-terminal domains of these α3 α4 α5 protomers form a trimeric “cap” (B), end-to-end association of which results in the formation of the hexameric NC1 domain (C). The quaternary structure of this hexamer is stabilized by hydrophobic and hydrophilic interactions across the planar surfaces of opposing trimers, and reinforced by sulfilimine bonds crosslinking opposing NC1 domains. Two key autoantibody epitopes within α3(IV)NC1 have been described, designated EA (incorporating residues 17–31 toward the amino terminus) and EB (residues 127–141 toward the carboxy terminus), which in the native form are sequestered at the junction with α4 and α5 chains within the triple helical structure. Binding through 7s domains (shown in orange) completes the lattice-like structure of the type IV collagen network (D). Reprinted from reference 102. Sera from all patients with anti-GBM disease appear to react to α3(IV)NC1, although a proportion will also have antibodies directed against other collagen chains, including α5 and α4, identified either in serum or upon elution from kidney tissue, and thought to arise via a process of “epitope spreading” after a primary response to the α3 chain (36). The directly pathogenic potential of these antibodies was clearly demonstrated by Lerner and colleagues in 1967, when they administered antibodies eluted from the kidneys of patients with anti-GBM disease to nonhuman primates, leading to the development of crescentic GN in the recipients (5). The pathogenicity of these antibodies has since been confirmed in a number of other species and animal models. Clinical observations support a pathogenic role for these antibodies; antibody titer, subclass, and avidity have each been correlated with disease outcome (37–40). In addition, the rapid removal of circulating antibodies by plasma exchange is associated with better outcome, and if kidney transplantation is performed in the presence of circulating antibodies, disease is likely to recur rapidly in the allograft (7,41). In addition to humoral responses, T cells also have a role in disease pathogenesis. Data from animal models suggest that T cells may contribute directly to cell-mediated glomerular injury, which can occur in the absence of significant humoral immunity (42,43), and glomerular T lymphocytes may be observed in kidney biopsy samples taken from patients with active disease (44,45). The strong HLA association and the presence of high-affinity, class-switched autoantibodies also indicate a necessity for T cell help in the development of the autoimmune response. Notably, mononuclear cells from patients proliferate in response to α3(IV)NC1 at much higher frequency than do cells from healthy controls, and the frequency of autoreactive T cells correlates with disease activity (46–48). The pathogenic T cell epitopes in humans, however, have not been consistently defined. That these autoreactive T cells can be identified in healthy individuals, along with low-level natural autoantibodies (49), suggests that tolerance to the α3(IV)NC1 antigen is not fully achieved during immunologic development. In addition, a rising titer of anti-GBM antibodies has been shown to predate the onset of clinical disease by several months (50), highlighting that several tolerance mechanisms must be disrupted before disease occurs. One such breach of “peripheral” tolerance is disruption of the quaternary structure of the Goodpasture autoantigen, and in particular disruption of the sulfilimine crosslinks that stabilize the association of opposing NC1 domains on individual collagen chains (Figure 1). This may result in modification or exposure of usually hidden epitopes, which is suggested to be a key event in the pathogenesis of disease (36). This may account for the association with etiologic factors that may disrupt alveolar (e.g., smoking, inhalation of hydrocarbons) or GBM (such as lithotripsy [51,52], and the other kidney pathologies discussed below). The recovery phase of anti-GBM disease is associated with a progressive fall in autoantibody titers (even in the absence of immunosuppression) and a lower frequency of T cells reactive to α3(IV)NC1. The emergence of a CD25+ suppressor T cell subset that may inhibit responses to α3(IV)NC1 has been described (53), suggesting that immunologic tolerance to α3(IV)NC1 can be re-established. This may explain the rarity of clinical relapses in anti-GBM disease, and the association with lymphocyte-depleting therapy with alemtuzumab. The majority of patients (80%–90%) will present with features of rapidly progressive GN. Forty percent to 60% will have concurrent lung hemorrhage, and a small minority of patients may present with isolated pulmonary disease. “Atypical” presentations are well recognized, and discussed in more detail below. Central to the diagnosis of anti-GBM disease is the identification of anti-GBM antibodies, either in serum or deposited in tissue, along with pathologic features of crescentic GN, with or without evidence of alveolar hemorrhage. In current practice, circulating anti-GBM antibodies are usually detected using commercially available enzyme immunoassays or bead-based fluorescence assays, which typically use purified or recombinant human or animal GBM preparations as antigenic substrate. Western blotting, using similar GBM preparations, may be a more sensitive method for antibody detection, although it is not widely available outside research laboratories. Indirect immunofluorescence using normal kidney tissue is an alternative method, although this requires additional input from a kidney pathologist and is prone to giving false negative results. A proportion of patients who have demonstrable deposition of IgG on the GBM by immunofluorescence, but who are negative for circulating antibodies by these conventional techniques, may be positive when tested by highly sensitive biosensor assay (54). In anti-GBM disease, the pathogenic antibodies are usually of the IgG class, with IgG1 and IgG3 subclasses predominating (37,38), although rare cases of IgA- and IgG4-mediated disease have been described (55,56). These antibodies may not be detected on routine assays. Serologic testing for anti-GBM antibodies is, by definition, an urgent laboratory test, and we recommend that results should be available within 24 hours for patients presenting with RPGN, particularly when there are contra-indications to kidney biopsy, because initiating treatment before developing a need for RRT may have a significant effect on outcome. It should be noted, however, that approximately 10% of patients do not have identifiable circulating antibodies with conventional assays, and so serologic testing should not be the sole method of diagnosis when kidney biopsy is available. Direct immunofluorescence for Ig on frozen kidney tissue has high sensitivity for detecting deposited antibodies, and is the gold-standard for diagnosis of anti-GBM disease, typically showing a strong linear ribbon-like appearance (Figure 2). An important caveat is that fluorescence may be negative or unclear in cases with severe glomerular inflammation, where the underlying architecture is so disrupted that the linear pattern may not be recognized. Other causes of linear fluorescence should be considered (including diabetes, paraproteinemias, lupus nephritis, and rarely fibrillary GN). Immunoperoxidase techniques using paraffin-embedded tissue may also be used, but may be less sensitive. Lung biopsy samples are not routinely used in the diagnosis of anti-GBM disease, and, in our experience, immunofluorescence on lung tissue is rarely informative. Kidney biopsy sample immunofluorescence for IgG revealing linear deposits along the glomerular basement membrane, and weaker staining of Bowman’s capsule and tubular basement membranes. Conventional direct immunofluorescence techniques will identify all IgG subclasses, although will not differentiate the antigenic target of the kidney-bound antibody. Noncollagen chain antigens, such as entactin, have been identified in historical case series, although their significance is not well characterized. In addition to detecting deposited anti-GBM antibody, immunofluorescence may demonstrate the presence of C components, in particular C3 and C1q, along the GBM (17). A proportion of patients may also demonstrate Igs or C deposition along tubular basement membranes. Crescent formation is the histopathologic hallmark of anti-GBM disease (Figure 3). Large biopsy series suggest that 95% of patients will have evidence of crescent formation on kidney biopsy, and that in 80% of patients >50% of glomeruli will be affected. The average proportion of affected glomeruli is approximately 75% (14,57). The proportion of crescents observed in the biopsy sample correlates strongly with the degree of renal impairment at presentation (17,18). These crescents will typically be of uniform age (Figure 3F), in contrast to other causes of RPGN, such as AAV, where a mixture of cellular, fibrocellular, and fibrous crescents may be seen. Crescentic glomeruli are likely to have areas of fibrinoid necrosis in the underlying glomerular tuft. Noncrescentic glomeruli may similarly have segmental fibrinoid change (Figure 3A), although often they may appear completely normal. In early or mild disease, segmental proliferative change may be seen, with infiltrating neutrophils or mononuclear lymphocytes. In severe disease, rupture of Bowman’s capsule, peri-glomerular inflammation (Figure 3E), progressing to granuloma formation with multinucleate giant cells, may be observed in a proportion. Given the acuity of disease onset, interstitial fibrosis and tubular atrophy are uncommon in anti-GBM disease (unless there is preexisting kidney pathology) although interstitial inflammation may be observed. Renal histopathology in anti–glomerular basement membrane (anti-GBM) GN. (A–C) Hematoxylin and eosin–stained sections demonstrating (A) segmental fibrinoid necrotizing lesion in early anti-GBM GN; (B) small, circumscribed cellular crescent; and (C) large, circumferential cellular crescent. (D–E) Demonstrate the use of Jones methylamine silver stain to delineate glomerular and tubular basement membranes, clearly identifying a segmental area of extracapillary proliferation (D). (E) Demonstrates obliteration of the glomerular architecture and rupture of Bowman’s capsule, with extravasation of red blood cells into the urinary space, and significant peri-glomerular inflammation. (F) Adjacent glomeruli with synchronous cellular crescent formation typical of anti-GBM disease. Electron microscopy is of limited additional value in the diagnosis of anti-GBM disease, showing nonspecific features of crescentic GN including rupture of the GBM and extracapillary localization of fibrin and proliferating cells. Electron-dense deposits are not seen in isolated anti-GBM disease, although electron microscopy is necessary to exclude concomitant glomerular pathologies, such as membranous GN, and may identify other diseases that may cause linear fluorescence (such as fibrillary GN and diabetic GBM thickening). Diffuse alveolar hemorrhage may be evident clinically, or identified by radiologic examination. Broncho-alveolar lavage may identify hemosiderin-laden macrophages, a characteristic feature of alveolar bleeding, and may also be useful to exclude other pathologies, such as atypical infection. In addition, pulmonary function testing, in particular the determination of the alveolar carbon monoxide transfer factor (KCO) may assist with the differentiation of alveolar hemorrhage from other causes of pulmonary infiltration. The utility of both bronchoscopy and functional testing, however, may be limited by the clinical condition of the critically unwell patient. Standard treatment for anti-GBM disease includes plasmapheresis, to rapidly remove pathogenic autoantibody, along with cyclophosphamide and corticosteroids, to inhibit further autoantibody production and to ameliorate end-organ inflammation. The use of this combination of therapies was first described in 1976 (58), and they remain the core recommendation of the latest Kidney Disease Improving Global Outcomes guideline for treating anti-GBM GN (59). We have reproduced a recommended treatment schedule in Table 1 (13). The inclusion of plasmapheresis is supported by observational studies that suggest improved renal and patient survival compared with historical cohorts treated with immunosuppression alone (18,60). In addition, a large contemporaneous Chinese study of 221 patients suggested better outcomes in patients who received plasmapheresis in addition to cytotoxic and corticosteroid therapy (61). To date, there has only been one randomized trial in anti-GBM disease, which compared the addition of plasma exchange to cyclophosphamide and steroids. Although this study was small (n=17), the groups not ideally matched at randomization, and its treatment regimens not representative of current practice, its findings supported the use of plasma exchange in anti-GBM disease (62). In particular, it demonstrated a much more rapid fall in circulating anti-GBM antibodies and improved kidney function in patients receiving plasmapheresis. Immunoadsorption is an alternative form of extracorporeal therapy that may be more efficient than plasma exchange for the removal of pathogenic autoantibody (although conversely it may not remove proinflammatory or procoagulant factors). In small series, it appears to have comparable outcomes to plasma exchange therapy (63,64), and we note that a prospective, open-label study is planned to study the kinetics of anti-GBM antibody removal using this technique (NCT02765789), which may be considered an alternative depending on local availability. In AAV, the equivalence of daily oral and pulsed intravenous cyclophosphamide in induction therapy has been established in a large randomized controlled trial (65). Nearly all published experience in anti-GBM GN, however, has used daily oral dosing, and so we recommend this as the first-line approach in this disease. Because the risk of relapse is very low, and approximately only 3 months of cytotoxic therapy is usually required, concerns about total cumulative dose of cyclophosphamide are less relevant than in AAV. In our experience, high-dose intravenous glucocorticoids are not required in the treatment of anti-GBM disease, provided the other components of therapy, in particular plasma exchange, can be initiated promptly (18). The use of other immunosuppressive therapies in anti-GBM disease is less well described. There are several reports of rituximab use, as either “add-on” to standard therapy or as a substitute for cyclophosphamide in patients who are intolerant (66). Similarly, the use of mycophenolate mofetil and cyclosporine has been reported in individual cases or small series (67–69). There is insufficient evidence, at present, to recommend their use in first-line therapy, although they may be considered in patients who have contra-indication or intolerance to conventional treatment. In addition to targeted immunotherapy, patients may require immediate organ support; in larger series, approximately half of patients require hemodialysis at the point of initial presentation (18). There are limited data on how frequently artificial ventilation is required, although one small series estimated that this occurred in 11% of patients with lung hemorrhage (70). There are case reports of successful use of extracorporeal membrane oxygenation in patients with very severe lung disease (71–73). Long-term follow-up of the largest cohort of patients (n=71) all treated with the combination of plasma exchange, cyclophosphamide, and corticosteroids, from the Hammersmith Hospital, London, United Kingdom, suggests that it is effective in treating lung hemorrhage in >90%, and in preserving independent kidney function in the majority of patients, including those who present with severe kidney dysfunction (18). In patients presenting with creatinine values <500 μmol/L, renal survival was 95% and 94% at 1 and 5 years, respectively. In patients presenting with creatinine >500 μmol/L, but not requiring immediate dialysis, renal survival was 82% and 50% at the same respective time-points. In patients presenting with an initial requirement for dialysis, however, renal recovery occurred in only 8% at 1 year. Other reports have described similarly low levels of renal recovery in patients presenting with dialysis-dependent kidney failure, with the highest rate of approximately 20% recovery in one series (66). Predictors of poor renal outcome include severity of renal dysfunction at presentation, the proportion of glomeruli affected by crescents, and oligoanuria at presentation (17,18,74). In the Hammersmith series, no patient who required hemodialysis and had 100% crescents on kidney biopsy recovered renal function, and so withholding treatment (and its incumbent toxicity) is often considered in these cases. An isolated case of renal recovery despite these findings (75), however, highlights the need to consider all cases for treatment, with specific attention to other features that might predict renal recovery on biopsy (such as concomitant acute tubular injury) and the ability of patients to tolerate each component of therapy. A short trial of early treatment may be considered, and rapidly tapered if there is no evidence of renal recovery within 2–4 weeks. In addition, the potential benefit of a period of immunosuppression to expedite autoantibody clearance, thus allowing earlier kidney transplantation, should be considered in suitable patients. We have used rituximab monotherapy, for example, in patients with ESRD who have an identified live-donor for transplantation, but remain anti-GBM antibody–positive, although controlled evidence for this indication is lacking. A recent retrospective study (an Australia and New Zealand Dialysis and Transplant Registry [ANZDATA] study) analyzed the long-term outcomes of 449 patients with ESRD due to anti-GBM disease, and found that their survival was comparable to patients with ESRD of other causes, whether they remained on dialysis or underwent kidney transplantation (15). Chronic respiratory sequelae after alveolar hemorrhage are uncommon (70). Relapse is rare in anti-GBM disease, occurring in <3% of patients in the Hammersmith series (18). It is usually associated with ongoing exposure to pulmonary irritants such as cigarette smoke and hydrocarbons (76,77), and avoidance of these precipitants is an essential part of long-term management of these cases. We recommend repeat kidney biopsy in cases of relapse with kidney involvement, in order to secure an accurate diagnosis and to exclude concomitant pathologies such as AAV and membranous nephropathy (discussed below). In confirmed cases, standard retreatment with cytotoxics and corticosteroids is usually indicated. In a patient with multiply relapsing alveolar hemorrhage we have found treatment with rituximab beneficial. Kidney transplantation performed in the presence of anti-GBM antibodies results in a high likelihood of disease recurrence in the allograft, at frequencies of up to 50% in historical series (41). Most centers therefore recommend a period of at least 6 months’ sustained seronegativity before undertaking transplantation in patients who have reached ESRD due to anti-GBM disease (59). Under these circumstances, and with current immunosuppressive regimens, recurrent disease is rare; the ANZDATA registry study found that 6 of 449 (2.7%) patients developed biopsy-proven recurrent anti-GBM disease, which led to graft failure in two cases (15). The frequency of other causes of graft failure was similar to patients transplanted for ESRD of other causes, and overall patient and renal survival in anti-GBM disease was similar to other groups in this study. These findings were somewhat in contrast to a previous European study that suggested patient survival was favorable in patients transplanted for anti-GBM disease compared with those transplanted for other primary kidney diseases (although significant differences in age at transplantation may account for this apparent difference in patient survival) (78). The European study also reported a higher frequency of recurrent disease (14%), although this may reflect differences in immunosuppressive use during an earlier era, and the study did not comment on anti-GBM titers and their relationship to timing of transplantation. In the current era, isolated case reports of recurrent disease still exist (79). Mutations in any of the genes which encode the α3, α4, or α5 chains may result in a failure to produce the normal type IV collagen network present in GBM, and thus lead to progressive kidney disease in Alport Syndrome. Mutations in the COL4A5 gene located on the X chromosome are most common, giving rise to typical X-linked Alport syndrome, although autosomal recessive and dominant disease are recognized with COL4A3 and COL4A4 mutations. After kidney transplantation, these patients may develop anti-GBM antibodies as an alloimmune response to the neo-antigens contained in “normal” α3, α4, or α5 chains in the kidney allograft. In X-linked disease, these antibodies do not recognize the individual EA and EB epitopes of the α3 chain recognized by sera from Goodpasture patients, but rather a distinct, composite epitope on the α5 chain, that is not sequestered within the native hexamer of the Goopasture antigen (36). It should be noted that commercially available anti-GBM assays, which are optimized to detect reactivity to the α3(IV)NC1 antigen, may fail to detect circulating antibodies in this setting. Anti-GBM antibodies may be detected in 5%–10% of Alport patients after transplantation, although the development of overt GN in the allograft is less frequent (perhaps owing to the effects of maintenance immunosuppression). When GN develops, however, it usually occurs early and carries a high risk of graft loss (80,81). Repeated transplantation in this setting almost invariably leads to more aggressive disease recurrence and rapid graft loss, and is undertaken at very high risk (82). Individuals with large COL4A5 gene deletions are at increased risk of post-transplant anti-GBM disease, and recent guidelines encourage the use of genetic testing to inform discussions regarding the risk of de novo anti-GBM disease after transplantation (83). The concurrence of ANCA and anti-GBM antibodies is recognized to occur at much higher frequency than expected by chance alone. In some series, almost half of patients with anti-GBM disease have detectable ANCA (usually recognizing myeloperoxidase [MPO]), and up to 10% of patients with ANCA also have circulating anti-GBM antibodies (84–86). The mechanism of this association is unclear, although it has been shown that ANCA may be detected before the onset of anti-GBM disease, suggesting that ANCA-induced glomerular inflammation may be a trigger for the development of an anti-GBM response, perhaps by modifying or exposing usually sequestered disease epitopes in GBM (50). Conversely, a recent study found that up to 60% of anti-GBM cases also had antibodies directed against linear epitopes of MPO, versus 24% recognizing intact MPO. The authors hypothesize that MPO-ANCA recognizing linear and conformational epitopes may arise sequentially, via a process of inter- and intramolecular epitope spreading (87). We recently analyzed the outcomes of a large cohort of these “double-positive” patients from four centers in Europe, and found that they experience the early morbidity and mortality of anti-GBM disease, with severe kidney and lung disease at presentation, requiring aggressive immunosuppressive therapy and plasma exchange (88). During long-term follow-up, they relapsed at a frequency comparable to a parallel cohort of patients with AAV, suggesting they warrant more careful long-term follow-up and maintenance immunosuppression, unlike patients with single-positive anti-GBM disease. There are several reports of anti-GBM disease associated with membranous nephropathy, occurring as a preceding, simultaneous, or succeeding diagnosis (89,90). As with the ANCA association, it is postulated that disruption of glomerular architecture by one disease reveals hidden epitopes that allow the second process to occur. A rapid decline in kidney function in a patient with known membranous nephropathy should raise suspicion of the development of superimposed crescentic nephritis or anti-GBM disease, and rebiopsy is recommended. We suggest that these cases are treated initially as for anti-GBM disease, although how they should be managed in the long-term is not clear. The authors of a recent case report suggest that rituximab may be a useful agent to treat both pathologies simultaneously (91). Unusual presentations of anti-GBM disease have been recognized for as long as the disease itself. Wilson and Dixon’s original 1973 report, for example, included the case of a male 14-year-old who had the incidental finding of linear IgG deposition on a kidney biopsy sample taken during splenectomy for hypersplenism and a diagnostic workup for optic vasculitis, who was treated with steroids only, and who had normal renal function after 1 year follow-up (7). There have been a number of series of “atypical” cases published in recent years, often with less severe renal involvement than is seen in the classic presentation of anti-GBM disease, although it not always clear whether these represent distinct clinical subphenotypes or heterogenous cases on a spectrum of disease severity (92–95). The largest of these series, reported by Nasr and colleagues, described 20 patients with mild and indolently progressive renal impairment, who had linear Ig deposition on kidney biopsy, but without predominant features of crescentic GN, and without overt lung hemorrhage (95). Circulating anti-GBM antibodies were not detected using conventional assays, and both patient and renal prognosis were good, with 90% and 85% survival at 1 year, respectively. They estimated that these atypical cases accounted for approximately 10% of anti-GBM cases at their center. Notably, half of the cases had light-chain restriction on immunofluorescence, although the authors suggest that the pathologic features were not in keeping with proliferative GN with monoclonal Ig deposition. They suggest that differences in the antigen specificity, Ig subclass, and/or the ability to fix C and recruit inflammatory cells, of these atyptical compared with “classic” anti-GBM antibodies, account for the less severe disease phenotype seen. Another small but well characterized series with a distinct clinical phenotype was recently described in Sweden; it included four young females, who had severe lung disease and minimal kidney involvement, who were found to have IgG4 subclass anti-GBM antibodies that were not detectable with conventional anti-GBM assays (56). That two of these patients demonstrated higher signal in the anti-GBM ELISA when using a nondenaturing buffer suggests that differences in epitope specificity might also account for the negative testing seen with the routine assays, and supports the hypothesis that differences in clinical presentation might be related to differences in the subclass or target of the anti-GBM antibody. Despite being one of the better characterized autoimmune diseases, unanswered questions remain regarding the pathogenesis of anti-GBM disease, which may have important clinical implications. These include the need to further characterize the variant forms of disease, and how differences in antibody subclass or specificity might influence presentation, the appropriate use of treatment, and outcomes. Better understanding of T cell functions, and in particular the role of regulatory cells that may suppress disease, may have therapeutic significance, both in anti-GBM disease and other autoimmune conditions. The induction of immunologic tolerance using mucosal administration of GBM antigen has been described in experimental models (96), which may likewise have therapeutic potential. Finally, the inciting events that cause autoimmunity to GBM antigens remain unclear. Idiotype–anti-idiotype interactions have been invoked in a recent study (97), and the role of infectious triggers that might operate via a similar mechanism in clinical disease induction could be explored further. As a rare disorder requiring immediate treatment, coordinating large, prospective studies in anti-GBM disease is challenging. In addition, the efficacy of current treatment regimens, when started early enough, is widely accepted. Future therapeutic studies, therefore, should perhaps focus on identifying “add-on” treatments that might improve outcomes in severe disease. We have recently shown that treatment with fostamatinib, a spleen tyrosine kinase (SYK) inhibitor, effectively reverses crescent formation in rodent models of anti-GBM disease (98,99) (and that intraglomerular SYK can be detected in patient kidney biopsy samples ), so it would be of interest to explore the use of this agent in advanced clinical disease. Another interesting agent that has shown efficacy in experimental models is IdeS (IgG-degrading enzyme of Streptococcus pyogenes), an enzyme that is able to cleave both circulating and membrane-bound Ig (101). IdeS was safe and tolerable in early-phase human studies, and a clinical study in severe anti-GBM disease, where it may promote rapid clearance of pathogenic IgG, has been proposed (EudraCT number: 2016–004082–39). Finally, large multicenter studies might aim to identify clinical and histopathologic indicators that reliably predict failure to respond to treatment, so that the toxicities associated with intensive immunosuppression may be avoided in futile cases. As an archetypal autoimmune disorder, such studies of anti-GBM disease and its experimental correlates are likely to provide fresh insights into the mechanisms of renal autoimmunity. However, it is the alarming clinical presentation, and the need for emergency treatment, often in critically unwell patients, that underscores the need for clinicians to be mindful of this rare condition, the pitfalls associated with its diagnosis, particularly in atypical and variant presentations, and the early and appropriate use of immunosuppressive and extracorporeal therapies, in order to prevent morbidity and to improve survival. We acknowledge support from the National Institute for Health Research Imperial Biomedical Research Centre.